The Earth Not a Globe! There really are people who think that the Earth is flat, just like it says in the Bible, regardless of what you see in pictures from space. Obviously, those pictures were faked. By who? By...The Conspiracy, of course. 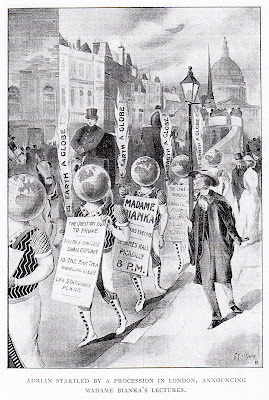 I believe that the Flat Earth Society were thus the first to promote that moonlanding-was-faked nonsense. Which brings us to Lady Blount. Wiki sez: "Lady Elizabeth Blount, wife of the explorer Sir Walter de Sodington Blount, established a Universal Zetetic Society, whose objective was "the propagation of knowledge related to Natural Cosmogony [the creation of the world] in confirmation of the Holy Scriptures, based on practical scientific investigation". The society published a magazine entitled The Earth Not a Globe Review, and remained active well into the early part of the 20th century. A flat Earth journal, Earth: a Monthly Magazine of Sense and Science, was published between 1901–1904, edited by Lady Blount." 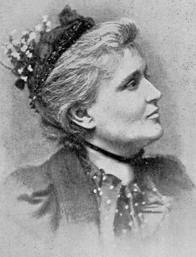 The Flat Earth Society message board posted a song written by Lady Blount from her 1898 book Adrian Galilio; a Songwriter's Story, described as "a unique combination of prose, poetry, illustration, drama and sheet music. And now, 112 years after its publication, the Society is very proud to present 'Star-Dream', a song from Adrian Galilio, as performed by The Nordic Countess, Ingeborg and with the help of gotham from our very own TFES forums! As far as we know it has never been recorded before, so this is truly something special." The song, a pleasant piano/violin instro (durn, no lyrics about the Flat Earth) is now off-line, so I'm a-postin' it here. Couldn't find any info anywhere on the performers Ingeborg and gotham, but there's a slightly lo-fi, somewhat off-kilter feel to this that I like. So there's this guy Phil from Chelmsford, Essex, UK who likes making rinky-dink Casio-esque beats and throwing in seemingly random samples, and he invites this guy he knows from around town named Rich to rap over 'em, but Rich can't rap, certainly can't sing, and just tells somewhat pathetic stories of his life over the music. Together, they are The Manor Boys. 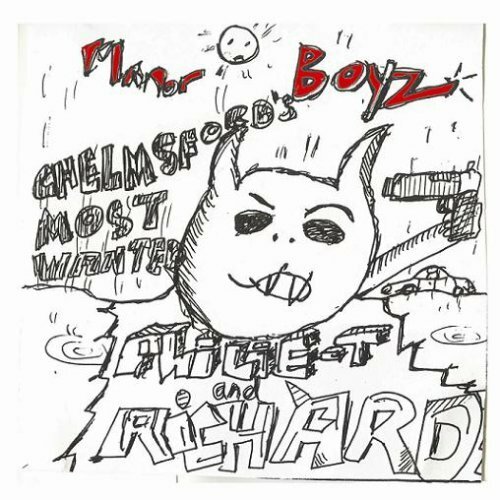 The first few tracks on their one and only album from 2006 have a guys-goofing-off feel like an R-rated Flight of the Conchords. Funny, but then Phil hands the mic to Rich. And that's when it get's really good. I feel kinda bad for poor ol Rich, but brother, I could not stop laughing. He's so honest and earnest as he reveals the details of his lowly life (his mum even appears on one track!) and lamely attempts humorous raps. Fortunately, Rich appears to be in on the joke. Most people on casual listen will think that this is all just hopelessly inept. Maniacs might find it weirdly wonderful. Manor Boys - "Chelmsford's Most Wanted"
Today we pay tribute to a recently deceased legend, a true musical master...Whitney who...? No, of course I'm referring to the percussionist Phil Kraus, who just died at the ripe old age of 94. Kraus played countless sessions for everyone from Sinatra to Ben E. King - yep, that's his scratching sound on "Stand By Me." 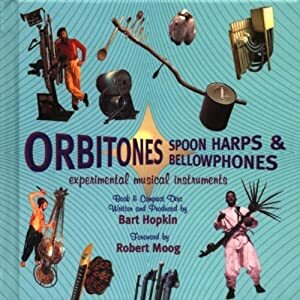 But strange music fans know and love him for his huge assortment of exotic/oddball instruments deployed on numerous albums teamed with his partner in percussives, Bobby Rosengarden. Apart from appearing together on Enoch Light's popular series of Light Brigade albums, Rosengarden and Kraus also made a number of instrumental albums their own selves, like this nutty number from 1965. "Percussion: Playful And Pretty" may indeed have it's playful and pretty moments, but it's also an exercise in Space Age stereophonic panning, and strange exotic moods. Songs like "Satan Takes A Holiday" were odd to begin with, but even more so after these two and their crew of fellow top session cats got a hold of 'em - the song "Goofus" alone features such instruments as that old circus music maker, the calliope, and something called a "buzzimba: "...a Rube Goldberg-ish contraption made up of wooden resonators that buzz daintily like a choir of horseflies when struck with a mallet. 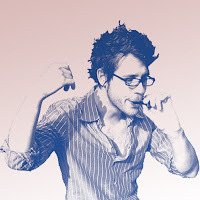 You might call it a kind of percussive kazoo." 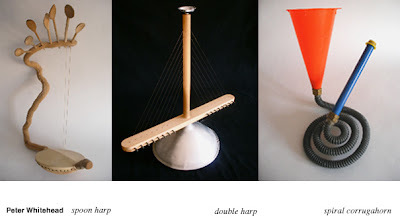 (Sounds like an African balafon, actually.) And the totally bonkers "The Comedians" really lives up to it's title - it could be a soundtrack to a classic Mexican silent slapstick. 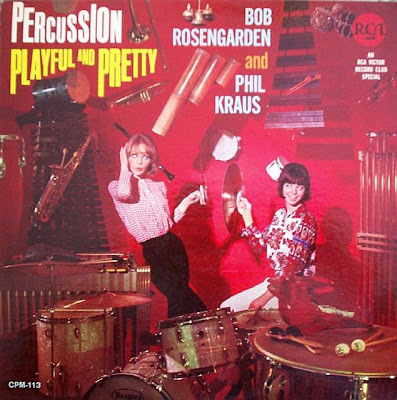 Rosengarden and Kraus "Percussion: Playful And Pretty"
Remember when you pulled down all the pots and pans in your mother's kitchen and made an "orchestra" out of them? Some kids never grow out of it. They become percussionists. One thing is sure about percussion: you're bound to get a bang out of it. But don't think percussion is nothing but a noise test. This album proves the contrary. It shows that in the hands of top-rank musicians, percussive instruments have a special kind of melodic charm and subtlety, sweetness and spice. Favorite old ballads emerge with new tonal gloss - a kind of spruced-up mood music. And rhythm numbers glint with tonal laughter - the sheer fun of clinking, clopping, tingling and tapping. The rest of the orchestra (clarinets, flutes, saxes, trumpet, trombone, bass, guitar, and piano) is made up of fairly conventional instruments. Except one. Arranger Sid Cooper had found a calliope - one of those outboard organs they used to play on the old Mississippi showboats. He just had to work that in, somehow, and trundled it into the studio on a serving cart. No steamboat boiler was handy, so a small air compressor was used instead to blow the pipes. Soon the music was clopping along, softly and tenderly like a brook with syncopated rocks in its bed. Or suddenly it sounded as if the building were under attack from a flock or rapid-action woodpeckers. For Bob and his crew, all the banging, tickling and tapping on their strange instruments was audibly a labor of love. It's also a fine stint of sheer musicianship. © 1965, Radio Corporation of America"
Some are well known like Waits or Aphex Twin (oh, and those 'Stomp' guys, remember them? ), and some so obscure I really couldn't find much info on 'em. It all sounds good, tho - industrial percussion, ceramic woodwinds, prepared piano, frazzled electronics, beautiful-looking audio sculptures, Ellen Fullman's room-size Long String Instrument, Uakti's PVC pipe Brasiliana...there is nothing wrong with this album. is available as a free download, 10 tracks that fly by in 21 minutes. It boasts inventive harping backed by beatboxing that would prove difficult to rap over, sometimes resembling yodeling or Tuvan throat-singing as much as anything found in old-school hip-hop. International Jew's Harp Society , some info about our activities, like the international festivals which are held in different countries. jewsharpguild.org which is very friendly american initiative with their own festivals. Thanks so much to danibal. Especially for those amazing Siberian babes. "One evening I was looking on my local Craigslist for musical gear and I noticed an ad where a person was selling a mixer I'd been looking for, along with some guitar effects pedals. The Craigslist poster had supplied links to a CDBaby page where he said you could hear what these pedals sounded like. He failed to note, however, that it was how these guitar effects would sound if one wanted to route the sounds of a jaw harp through them. 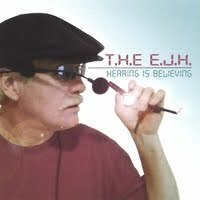 With curiosity I listened to all the samples on the album which he had entitled he EJH: Electric Jew's Harp. He was named Bruce Wayne Hodges and he’d recorded an entire CD’s worth of tunes on an electronically processed jaw harp. It all sounded sort of the same, like outtakes from the Dr. Who theme but I was fascinated that someone would do it and it did have a certain early Electronic, Electro-acoustic appeal. And considering that he was a local artist, it seemed natural that I would make contact with him. He turned out to be a 60-ish looking old guy who knew nothing about Avant Garde music,Noise music or anything. The only 'weird' music he knew about that he could compare himself to was Pink Floyd. He explained that he really just wanting to sound like a guitar player but could never master the instrument after many attempts over the years. He’d always had a jaw harp, or Jew’s Harp as he’s inclined to call it. Running the sound through guitar stomp boxes just seemed natural to him.When I offered that he could be considered an Outsider musician, he sort of bristled, then seemed to warm to the term. I was fascinated by Bruce and that an ordinary guy would make such weird sounds with no preconceived notions of strange music - like it just seemed natural to him, coming as if from some innate impulse. We corresponded back and forth a few times and made plans for him to come onto my radio show on KBOO. In the intervening months leading up to the date, I got numerous emails from his then-fiancee, who apparently was acting in the capacity as his business manager. She wanted all kinds of assurances from me and demanded to know how many people would be listening, how would this show be promoted and wanted me to plug his CDBaby site. When the event rolled around and Bruce showed up with his adult son in tow (his manager had apparently stayed home), he shocked me by telling me that he had lost all of his equipment to a pawnbroker and that he was using equipment with which he'd never rehearsed with.He spent more time getting used to the equipment, but managed to do a brief but fascinating set. Listeners were calling in, wanting to know the origin of the strange sounds over the airwaves. The next day, his 'manager' emailed me to say that while Bruce was a nervous wreck before the show, he was energized at having been on the radio and was ready to perform live shows.I suggested that Bruce try out for No Fest, a local noise festival in nearby St. Johns, Oregon and he eventually got himself on the roster after I'd introduced him to one of the bookers. Bruce showed up with his whole family. He seemed terrified, even though he seemed to think the rest of the noise musicians made his music fit right in. I stuck around for Bruce's set (he was billing himself as B.A.T.T. now - Bang A Twang Thing) and he'd added a few more harps and was deftly switching between them like changing chords on a guitar. In this configuration, he was now backing himself with a stiff 4/4 drumbeat on a guitar processor’s drum machine preset. He sounded exactly like what he had endeavored to do in the beginning: emulate a guitar player with a Jew's harp.He did OK, though, even though the noise crowd seemed to turned their nose up at the drum beats, the many young kids and older people in attendance thought he was cool.I chatted a bit with Bruce and he seemed stoked and disappeared into the crowded festival to catch more Noise acts. I think he felt like he had found his tribe at last. I should note that this whole time, I'd been getting emails from his wife, who insisted that any day now, Sony, Warner Bros, etc. were going to beat down their door with a contract. She wanted to book Bruce on Leno. Everything. She wanted my advice, based I guess on my expertise as an unpaid volunteer community radio programmer. She just knew rock stardom was right around the corner.I replied back to her once, telling her my take on what to expect with an outsider act and how they could at least make the most of something with such limited appeal. I told her most self-styled artists create out of the sheer love of the act and that if you produce any CDs, tapes, etc., don’t be disheartened if they end up in piles, forming coffee tables in your living room. The goal, I told her, is to have Bruce record, record, record. She wasn't having any of it. She knew that Bruce would be discovered and that he'd be making movie soundtracks, tv specials, you name it. Bruce couldn’t get a more determined manager if he paid 50% of everything he gets out of his act. She really believes in him and his strange music. I still occasionally get emails from Bruce. His experiments where he does something out of sheer expedience - like his overdubbing himself by playing with multiple layers of self-shot YouTube videos - affirm that the man’s still got it. He’s still twanging away in his own musical world. T.H.E. E.J.H. : "Hearing is Believing"
Mucho thanks to Rich for heppin' us to these fine, freaky phonics. OUTSIDER MUSIC : ART OR EXPLOITATION? I received an interesting comment on the John North Wright post, and, as it is not the first such comment we've received here, I thought I'd not just let it hide as a post comment, but turn it into a post of it's own, as I believe the commenter probably speaks for many, and I'm sure some of you would like to chime in as well. radioman said: "I can see the appeal of this kind of stuff, yet, at the same time, it feels almost as if one is back in the 1700s, laughing at the inmates in the asylum. In some respects, that guilty feeling is ameliorated by knowing that, since he's dead, he isn't aware that we're poking sticks though the bars of his cage. Keep up the good work. Sort of." I responded: "Hi radioman, I understand your ambivalence towards this kind of outsider music, but I, and plenty of other readers of this blog, really, genuinely appreciate the honest nature of this kind of music - it challenges the idea that "real" music (music suitable for review/criticism) is only made by professionals who are often only interested in making it in showbiz, becoming stars, glorifying their egos, etc. As opposed to the likes of Wright who appear to have more pure motives. As Lee Ashcroft wrote in the Bernie Sizzey post, they make music because they HAVE to. Sure, there may be a freak-show aspect, but it's deeper than that - I find it fascinating to peak into the brains of those who are otherwise invisible to our homogenous culture. Also: These people have often been lonely and alienated throughout their lives, and it means a lot to them to have people finally listening to them. Hearing someone come from out of left field and approach music from a completely fresh, unaffected perspective can be a delight, in contrast to the predictability of "normal" music, even in the so-called alternative world. There's no denying that it can be a little disturbing at times, but it can also humanize the kind of people we might otherwise turn away from. That's a lot to chew on, ultimately making it all a lot more rewarding than tossing another coin into Lady Gaga's bank account." Thanks to radioman for forcing me to sit down and spell out the philosophy of this here web-log!